Come play at the beach for your next family vacation at a North Myrtle Beach resort property that features everything from six outdoor swimming pools to tennis courts. Ocean Creek South Tower is just one part of the larger North Myrtle Beach resort known as Ocean Creek. This gated, 57-acre North Myrtle Beach resort community is beautifully landscaped, filled with towering trees and features golf cart paths and walkways. Ocean Creek South Tower is an ocean view high-rise that is one salt water channel away from the white sandy beaches and the Atlantic Ocean. Ocean Creek South Tower has wonderful two-bedroom North Myrtle Beach vacation rentals that are perfect for families. These two-bedroom North Myrtle Beach rentals have two baths for your convenience. These condos in North Myrtle Beach, South Carolina have gorgeous ocean views, a terrific kitchen and all the modern amenities of home. So make reservations for Ocean Creek South Tower and make yourself at home. The North Myrtle Beach condominium rentals sleep six people. There is plenty of space for your family of six to spread out in these North Myrtle Beach condominiums. The kitchen in each of these condos in North Myrtle Beach, South Carolina has full-size appliances, including a dishwasher. Make some popcorn in the microwave for a movie night. Bake some cookies in the oven that you can take to the beach with you. There is plenty of counter space for making a picnic lunch and the coffee pot, blender and toaster are easily accessible in these kitchens. There is a breakfast bar that looks into the dining area and the living room. A ceiling fan keeps things cool in these North Myrtle Beach vacation rentals. The master suite of these condos in North Myrtle Beach, South Carolina opens to the balcony, which is a really nice feature in these North Myrtle Beach vacation rentals. Leave the sliding glass doors ajar during the night and listen to the sound of the waves crashing ashore. What a way to fall asleep during your North Myrtle Beach vacation. The ocean view balcony is furnished so you can relax anytime day or night during your North Myrtle Beach vacation. Watch the tide ebb and flow while sitting on your ocean view balcony. The salt water channel that runs right in front of Ocean Creek South Tower is the only thing separating your family from the white sandy beaches. The ocean view balcony in each of these North Myrtle Beach vacation rentals is the place from which your family should watch the oceanfront balcony. 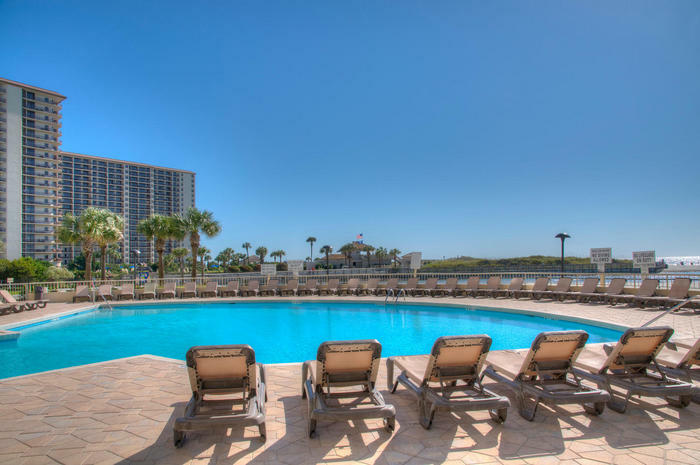 What a glorious sight for you to enjoy during your North Myrtle Beach vacation at Ocean Creek South Tower. Elliott Beach Rentals is not affiliated with onsite management or the HOA of Ocean Creek South Tower.